This is the first of three blog posts about heart rate and nasal vs. oral breathing. Today I will cover heart rate and discuss the general experiment tomorrow. Typically when I run I am glancing at my watch to check-up on my pace. My pace depends on how much of a workout I want for the run. While using pace is a general way to keep consistency in your running, heart rate is a better measure. Heart rate is a better measure because your heart rate is proportional to the amount of work that your body is doing in a given condition. 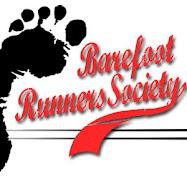 I noticed while I was running on the cool beach last week that I was able to run a 9 minute mile with no problem, but as soon as I came home I was huffing and puffing at a 10 minute mile due to the high humidity of the deep south. Comparing pace in this situation is not fair at all! So what sparked this interest in heart rate? I recently started taking an Athletic Training class as an elective, and the topic was brought up. We learned some basic formulas that tend to be pretty accurate. I will only use two for the sake of this post. While finding this formula I found many people that disagreed with it. I honestly don't think it is going to make much of a difference. Another way for me to find this is to just go running balls-to-the-walls. Anyway, I am 21, so my maximum heart rate is going to be 199 BPM. After finding my resting heart rate I can determine my target heart rate. To find my resting heart rate I used my Garmin Forerunner 305 + Heart Rate Monitor. I simply laid on my floor and waited until my heart beats hit their lowest point. It is probably best to do this immediately after waking up, before coffee, for better accuracy. It turns out my resting heart rate is 41 BPM. But wait. What intensity do I need to be running at? Typically I want to be in the aerobic zone, which is between 70% and 80%. The aerobic zone is preferred if you are training for an endurance event. So let's shoot for some middle ground at 75%. I now know to get a good aerobic workout I need to be running around 159.5 BPM. Next, for tomorrow's experiment I will need to find my Healthy Heart Zone, or warm up rate. The intensity of a warm up should be around 50-60% of my maximum rate. So I'll shoot for 55%. 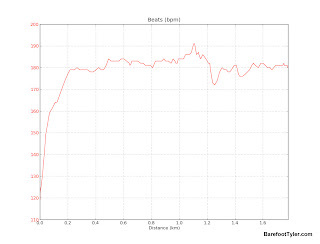 Now I know when I am doing my walks I should be at about 127.9 BPM. Later, I will work this information into my experiment. 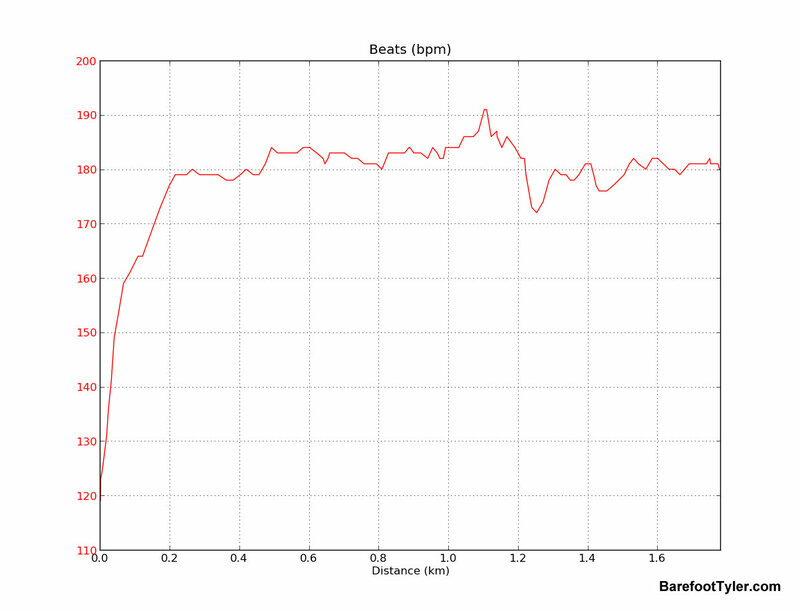 I suggest finding your aerobic heart rate and warm up heart rate and trying to run with them. For a non-Garmin way to take your heart rate, check out this information at the University of Iowa. When did they start putting letters into math equations? Why not write a 'puter program that asks me all the pertinent data and demographics. Then have it tell me my target HR. I usually find my target HR by running until the chest pains start, then back off alittle.